Putin says what he means and means what he says. His style is forthright. He follows through on what he says. Obama is polar opposite – an inveterate serial liar with no credibility whatever. He says one thing and does another. He’d end the charade about a so-called Iranian nuclear weapons program the whole world knows doesn’t exist. He’d end Big Brother spying on everyone without just cause. He’d obey international, constitutional and US statute laws instead of breaching them consistently. He’d serve all Americans equitably – not just its rich and powerful. Washington lied claiming ABM withdrawal was to counter threats from North Korea and Iran. None exist. Both countries want normal relations with America and other Western nations. Instead they’re bashed for maintaining sovereign independent rights. The Bush administration ended ABM to install so-called anti-missile systems intended for offense targeting Russia and China. Obama pursues the same belligerent policy. “The problem is (America is it’s) constantly trying to impose (its) standards and decisions on us with no regard to our interests,” said Putin. Putin accused Washington of irresponsibly meddling in Russia’s internal affairs – the same way it operates globally, a nuclear-armed bully throwing its weight around. “This is no dialogue,” Putin explained. Instead “an (unacceptable) ultimatum. Don’t speak the language of ultimatums with us,” he stressed. After Soviet Russia’s dissolution, Washington began aggressively expanding east using enlarged NATO as a dagger targeting its heartland. “I’m completely convinced that after the so-called bipolar system ceased to exist, after the Soviet Union disappeared of the political map, several of our partners in the West, including the United States first and foremost, came under euphoria and instead of setting up good neighborly and partner relations, they began grabbing free geopolitical space as they saw it,” said Putin. “We are not the root cause of…crisis…in Ukraine,” Putin explained. Multi-world polarity is the new way of things Putin stresses often. Instead of accepting it and building good relations, US-dominated NATO expanded east in violation of what it pledged not to do. 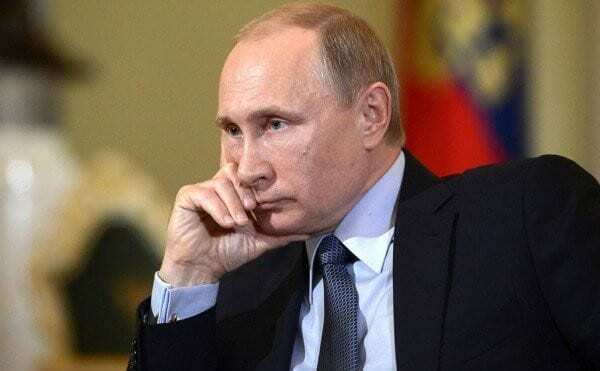 “Quite possibly, some of our partners might have gotten an illusion that a global center like the Soviet Union had existed in the postwar world order and now that it was gone, vacuum appeared and it was to be filled urgently,” Putin said. Kiev must shift from “manipulations to practical work” – including constitutional reform, accepting Donetsk and Lugansk People’s Republics’ special status, decentralization, a new law on municipal elections, amnesty as agreed on, and full implementation of Minsk ceasefire terms. So far, nothing constructive was accomplished. Aggression on Donbass continues. No dialogue is in prospect to end it – or efforts to afford its residents their legitimate rights. “If the current Ukrainian authorities think that it is Ukraine’s territory and there live the Ukrainians who enjoy the right to be provided with disability benefits or pensions and who have earned them working in accordance with the Ukrainian law, then the Ukrainian authorities cannot deny payments of these benefits as they just have no right to behave so! They are violating their own constitution,” Putin explained. Given lunatics running the asylum in Washington, the possibility of East/West confrontation is greater than perhaps any time during the Cold War. Posted in AMERICAN BRAINWASH, AMERICAN PROPAGANDA, ROTTEN MEDIA, RUSSIA & NOVOROSSIYA, US GOVT CRIMES.